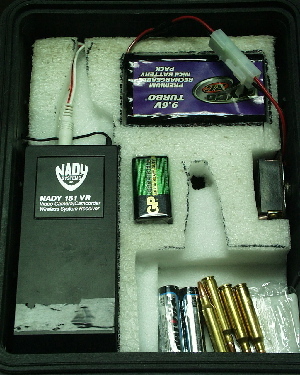 Nady 151 reciever with Tyco 9.6 volt nicad battery inside the box. The foam is for insulation and orgainization. 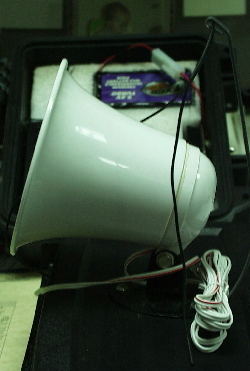 Speco 5" SPC-5P speaker with Nady soft antenna. These are the other parts you'll need: Nady 151 VR-LT wireless microphone, Rio 600 MP3 player, Speco 5" SPC-5P 15 watt speaker, 1 each 6' Radio Shack #42-2420 cable, 2" velcro with self sticking back (Walmart) and 3 each #8 screws, nuts and washers. The following parts are for the rechargeable option and not necessary; Ni-Cad 9.6 volt RC battery (Radio Shack #23-342), Lighted Rocker Switch Radio Shack #275-712, RC 9.6 volt battery pack connector repair kit Radio Shack # 23-445. For the rechargable option 3 female red .25"insulated automotive connectors and a foot of 16-18 awg copper wire is required. We'll put the basic caller together first and then add the rechargeable option. 1st remove the foam from the case and we'll mount the speaker to the top of the box with 3 each #8 screws. Use the base as a pattern and drill 3/32" holes where you would like the speaker to sit. I like mine in the center. With the speaker in place drill a 3/8" hole in the back of the pistol case 3" from one end and half way between the hinge and the top of the box. The speaker plug will go into the box here and the soft antenna will come out of the box through the same hole. Next we need to position the Nady reciever near the rear of the open case with the antenna close to the 3/8" hole we drilled for the speaker/antenna routing. Run the speaker jack through the hole and the antenna out the hole and adjust the location to suit your desires. When you are satisfied cut two matching strips of velcro hook and loop 2" long. Peel the back on the loop (soft) side and place it on the Nady reciever just above the battery compartment. It should just fit between there and the belt carrier slot. Push it firmly in place. Now peel the hook side and place it evenly and very lightly on top of the loop side, HOOK SIDE FACING LOOP SIDE, ADHESIVE SIDE UP. What we are trying to do is place the transmitter back where we liked it and attach the hook side adhesive to the bottom of the pistol case at the same time. So gently push the reciever into position with the hook side adhesive facing the bottom of the pistol case. The adhesive is pretty strong and will adhere well to the plastic case. Now gently remove the reciever. The loop side should be stuck to the pistol case and the hook side should be stuck to the reciever. Now all we need to do is put a 9 volt battery in the Nady reciever, velcro it down in the box, plug the speaker into the headphone jack, turn the volume wheel all the way up and trim the lower foam to suit your needs and run the antenna out and drape it over the speaker. Turn the reciever on and it's ready to go. For right now let's load some batteries into the Nady transmitter and Rio. 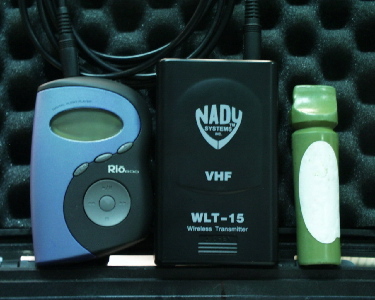 The Nady transmitter takes another 9 volt batter and the Rio takes 1 each AA battery. Now connect the Rio to the Nady with the 6' patch cord. This cord also serves as the sending antenna so keep in line of sight to the soft reciever antenna. Turn the works on and coyote music will come out a blasting. I tested mine with a db meter and got 110 db's at 3 feet with no distortion. Considering 85 db's is the limit for exposure before earplugs are needed I'd say this was more than enough volume.